Those of you that are interested in learning to program, may be interested in a new Arduino compatible training board which has been designed by Ascension Engineering, that has been specifically designed to make learning electronics easy and entertaining. 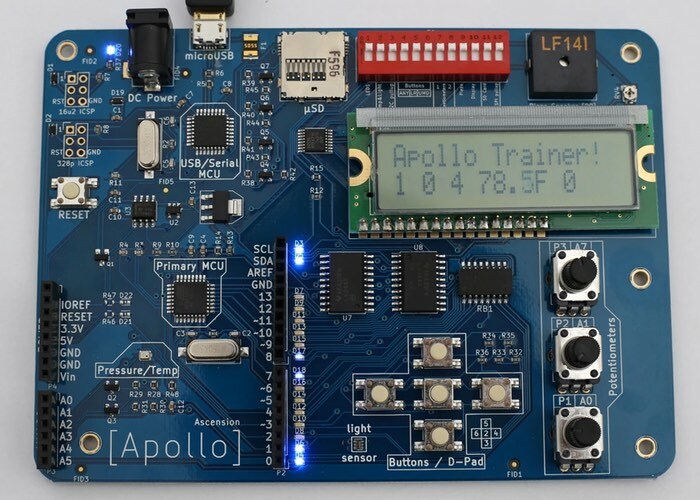 The Apollo Arduino training board comprises of a number of components including three high quality single turn potentiometers, buttons, piezo speaker, light sensor, microSD card, pressure gauge and more. Whether you are interested in learning to program or control lights in your house, the Apollo is a flexible and fun Arduino-compatible trainer board designed to make electronics easy and useful. We have completed a sample production run with our manufacturing partner. In order to bring the Apollo to market at an excellent price, we need to scale up our production, which requires additional funding. One of the other hurdles is to acquire FCC certification, since all products that include a microcontroller should receive a FCC unintentional radiator compliance certification. If our kickstarter is successful we expect to have the Apollo ready for shipment within 90 days. Simply put, the hardware. The Apollo features many hardware accessories in a clean compact layout with all the libraries and sample code ready to go. Our goal is to make it easy to get started with hardware integration by providing the Apollo in a ready to use state. If the Apollo Arduino training board is something you are interested in jump over to the Kickstarter crowdfunding website to make a pledge from just $65 for super early bird backers and help the Apollo make the jump into production.